Our five pages on Silver's Wheeling years (June 1915 - June 1917) are largely materials new to the internet. We thank our Wheeling sources Jocelyn Cooper, Temple Shalom's librarian-archivist, and Lou Horacek, librarian at the Ohio County Public Library. For the Cleveland materials we thank Museum Director Sue Koletsky and Historian Ruth Dancyger, both of The Temple - Tifereth Israel, and the archives staff of the Western Reserve Historical Society. Founded in 1849 by German speaking Jews, Leshem Shomayim (for the sake of Heaven) in Wheeling, West Virginia was the state's first Jewish congregation. 1865 - replaces its Orthodox siddur with a prayer book composed by Rabbi David Einhorn, then champion of the radical wing of Classical Reform. 1877 - translates constitution and bylaws to English. 1892 - joins UAHC (Union of American Jewish Congregations) founded in 1873; now URJ (Union for Reform Judaism). 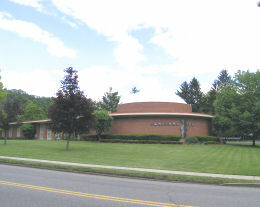 For more on the congregation's history visit Julian Preisler's West Virginia Jewish History web site and the Ohio County Library site. 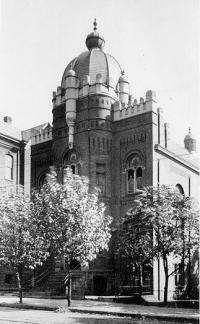 Eoff Street Temple, constructed in 1892, used until 1974. Photo 1904. On display in a credenza in the lobby of Temple Shalom are several large books, bound in red leather. They hold Leshem Shomayim's old handwritten minutes. The minutes of June 25, 1914 record the election of Louis D. Gross as rabbi for the two years 1914-16. Unfortunately Rabbi Gross, having previously held himself available to serve, declined. Near the end of the first year of his two year contract, Rabbi Lazaron announced that he had accepted a position at the Baltimore Hebrew Congregation. In May 1915, for the third time in two years, Leshem Shomayim needed a new rabbi. 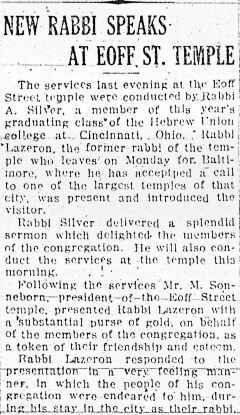 In June 1915 Abba Hillel Silver had graduated from the University of Cincinnati and been ordained by the Hebrew Union College. In four years he had completed his work at both institutions, earning awards from both. But Silver, valedictorian of his HUC class, had no pulpit. 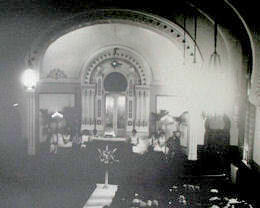 On Friday evening and Saturday morning June 18-19, 1915 he visited Wheeling, conducted services at Eoff Street Temple and "delivered a splendid sermon". Minutes of a Leshem Shomayim meeting on Saturday June 19 record the selection of Rabbi A H Silver as rabbi for one year, effective September 1, 1915, at a salary of $2,500. Now Abba Hillel Silver, only 22 years old, had a pulpit.